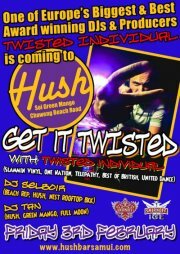 Join us on Friday 3rd February for Twisted Individual’s FIRST SET in Thailand. Playing the best in up front Drum n Bass, this should be a night to remember!! Following the success of his album “Tooled Up!” Twisted Individual found himself in the spotlight and has showcased his skills on the decks all around the world. A regular at all the major UK promotions including Slammin Vinyl, One Nation, Telepathy, Best of British, United Dance, Accelerated Culture, as well as residencies at all the Formation and World of Drum & Bass nights all over the World, Twisted is now an exclusive member of the top flight of D&B DJs. Always armed with a bag of fresh dubs to unleash on the crowds, his explosive partnership with MC Biggie has smashed many venues over the past few years. In this time Twisted has also been fortunate enough to have his travels take him all over the world, notching up stamps in his passport and champion hangovers everywhere from Germany to Estonia, USA to Australia, Spain to Brazil and pretty much everywhere else in-between. After his tune Bandwagon Blues exploded onto the scene and instantly became an anthem with rewind after rewind ensuring this was a front runner in every DJs set. Off the back of his previous success and other tracks such as Rusty Sherrif’s Bag, Heavy Metal, and Hand Grenade – Twisted found himself up for 3 categories at the 2003 Accelerated Culture Awards, walking away with awards not only for Best Tune for Bandwagon Blues, but also Best Producer.